Click here to download the Comprehensive Stewardship Guide created to fulfill Goal 9.1 Comprehensive Stewardship Program. 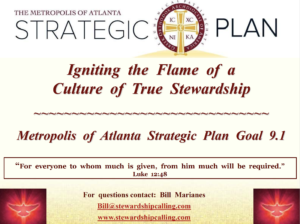 Last month as part of the meetings during our Archangel Michael Feast and Honors, Bill Marianes gave a comprehensive presentation meant to “ignite the flame of stewardship” at the parish level. For those of you who were unable to attend, the presentation was filmed, and the videos can be accessed on YouTube here. 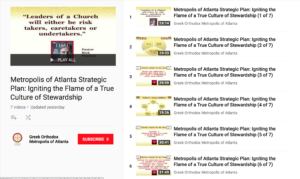 This program provided the systematic 15 steps necessary to have the most successful stewardship program in your Parish based on the comprehensive stewardship program found on this page.